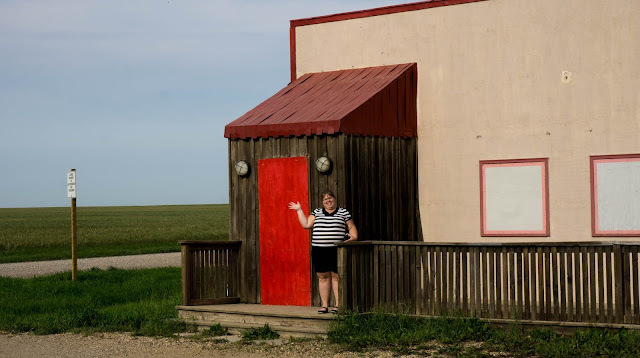 If you are Canadian you likely do not need to be told that Corner Gas is a hugely popular Canadian sitcom set in the fictional town of Dog River Saskatchewan. Corner Gas remains one of my most favourite shows of all time, partly because it is full of pithy sarcastic humour, and an amazing amount of Canadian references and guest stars. 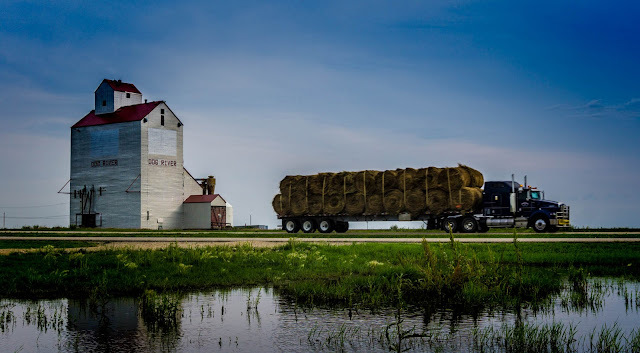 What you may not know is that the show was shot in a real life town called Rouleau SK. Many of the buildings, including the main set, exists as real places in that town. This means, of course, that one can actually go and visit Dog River (squee!). Checking out Dog River is literally one of the items on my non-actually-recorded anywhere figurative bucket list. So, naturally, I put "visting Dog River" at the very top of the "must see" places for our Great Canadian Road Trip. So come along with me and join in the adventure of the real life fictional town of Dog River. The show centers on the towns only gas station, Corner Gas, and the attached cafe, The Ruby. This building was built as a set for the show, but it still exists. It is the first thing one sees when entering Rouleau SK from the west. If you look to the left of the building you will see that the horizon is really flat. This is a running joke in the show. ("First you tell me that my dog ran away, then you tell me that it took three days.") The first thing that became quickly apparent - they ain't kidding about the flatness. I have never been to a place that was flatter than this part of Saskatchewan - the horizons were a *long* way away. The Ruby is also home to a geocache, so of course I stopped to sign the log. I couldn't resist leaving my mark to say I visited The Ruby (I would have preferred that mark being the signature on the credit card slip when I paid for a meal served by Lacy, but alas my trip to the real life fictional world of Dog River has significant and annoying limitations - beggars can't be choosers). One of the centerpieces of Dog River, like most small prairie towns, is the grain elevator. Normally the town's name is on the elevator, but in Rouleau's case they adopted the name that has made them famous, Dog River. This shot was taken with the Corner Gas parking lot. I had to wait a good 15 minutes before the right truck drove by. It was worth it. Once we finished checking out the set, we went exploring in the town (it didn't take long - it is a very very small town). 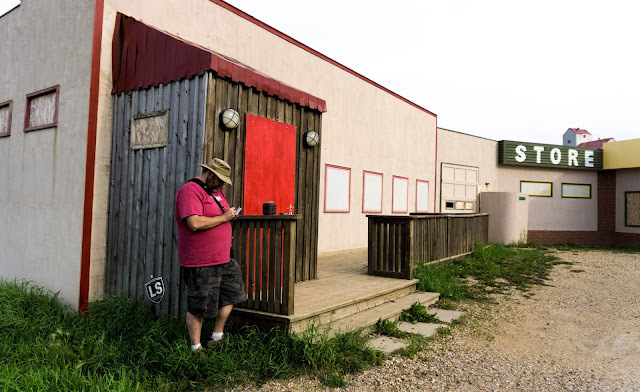 There are geocaches on the grain elevator, the Surveillance Bush, the hockey rink (this *is* Canada after all), and in a random spot along a dirt road. Fans of the show may recognize the place as the location where Oscar (Brent's bumbling father) found a pair of pants (Holy hell! A perfectly good pair of pants!"). (Remember that episode? It was a good episode. If you don't remember, go look it up, jackass! (just kidding, I didn't remember the location either)) If you really don't remember, I am standing in that spot (-ish) here signing a cache log. These locations are, starting at the top left, The Howler (local newspaper), Hoff Insurance (insurance and liquor store - note that the business that actually owns that building also sells insurance *and* liqour... the meta-nature of this fact really butters my parsnips). The police station. The Dog River Hotel. Oscar and Emma's house, and an analog for Hank Yarbo's pick-up truck (yes I know his is blue, and this is red - no I don't care. I am sticking to it, I saw Hanks truck. Deal with it). The Dog River Hotel is actually a bar and grill, and I believe the only place to buy food in town. In the show it is known as The Bar - nice to know it lives up to the name. I was forced by the rules of uber-fandom to delve as deeply as possible into this real life fictional world, which means I was required to grab supper at The Bar. I was all prepared to order a chili cheese dog (Brents favourite food), until my wife reminded me that I dislike chili, so I got the next best thing: bacon hot dog. 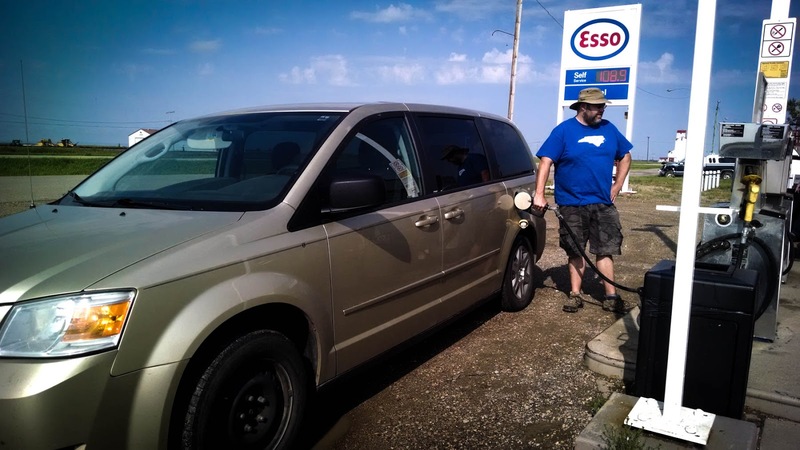 Before we left Dog River, we filled up the Geovan of Destiny at the only gas station in town. 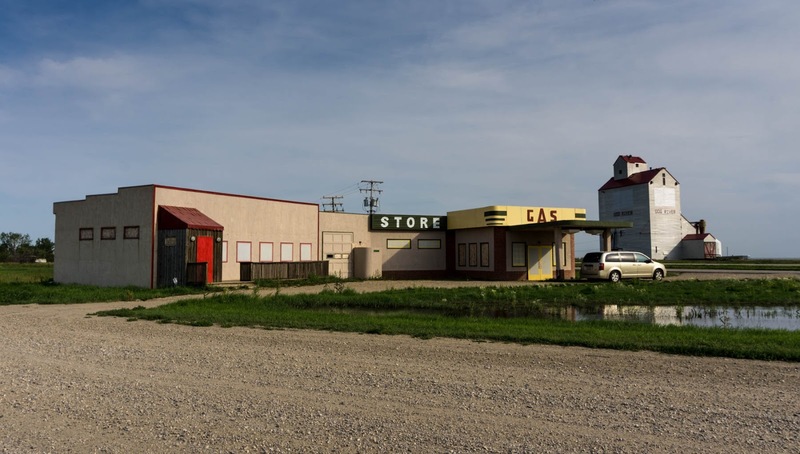 By the rules of real life fictional locations, this is the proper analog for Corner Gas. So I got gas at the original Dog River gas station... excellent! One more thing checked off my bucket list. Everyone should come visit Dog River. Even if you are not a fan of the show (which you should become one. All the cool kids are. You wanna be cool right? ), it is a nice picturesque town. 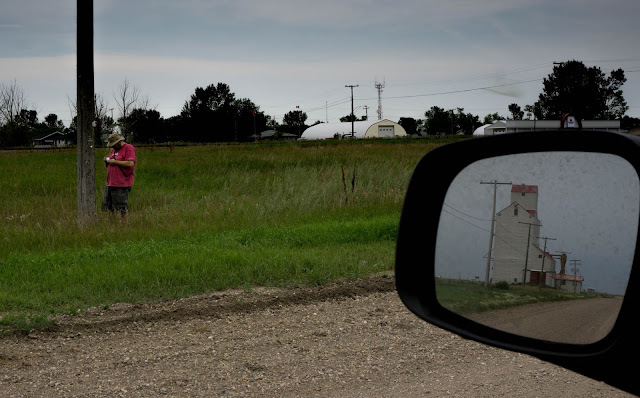 It is also easy access - just an hour north of North Dakota - so (if my knowledge of US geography is as good as the average Americans knowledge of Canadian geography) my Yankee friends should be able to make it within a couple hours drive. So that was Dog River. This is actually the last stop we made in Canada during our road trip. We did some night photography on the way back to the hotel, which I will cover in the next post, but after this we head back stateside for the remaining few days of the trip. Stay tuned! It's getting dangerously close to conclusive now.